Steve has been teaching and practicing architecture for the past 32 years. 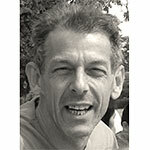 He joined London South Bank University in 1990 as a Senior Lecturer in the division of Architecture after having graduated with a Master Degree from the Royal College of Art in 1986. He has had a wide and varied teaching background including the Bauhaus, Dessau, collaborations on projects with the Arts Council and the British Council and as an external examiner at BHC Athens and is currently external assessor at Cardiff University. As a partner of Tankard Bowkett, a small architectural firm, since 1992 he has had the practices work published and exhibited widely. His work on the regeneration of industrial buildings in the east end of London resulted in a major change in planning policy within Hackney Borough Council. Steve's role as the division's undergraduate admissions tutor inspired his book, 'Archidoodle; an architect's activity book', to encourage students to draw via a variety of design exercises. 'Archidoodle' has sold over 80,000 copies and is published in 10 languages. The follow-up publication on urban design, 'Archidoodle City' was published in February 2017 and is currently in 4 languages. Steve has curated a number of exhibitions, installations and public events as well as presenting public lectures on a diverse range of subjects such as 'Home' at the RIBA and 'Concrete Elegance' at the Building Centre, London.